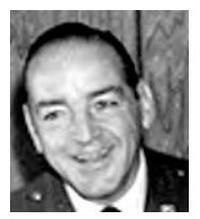 Col. McGovern had a distinguished military career that spanned 31 years. He was an Air Force combat veteran of World War II, Korea and Vietnam, earning two Distinguished Flying Crosses. In July of 1952, he made the first helicopter transatlantic flight in a Sikorsky S-19, flying from Westover Air Force Base to Scotland. Working with Igor Sikorsky to modify the aircraft to accommodate added fuel requirements, Colonel McGovern led a section of two H-19s which flew 50+ hours over 21 days, setting non-stop records along the way. Later, he became Vice Commander at Templehof Air Base in Berlin and Base Commander at Westover Air Force Base, Amherst, Massachusetts. He came to rotorcraft late in his military career, yet was captured by their utility as a workhorse for soldiers everywhere. Air Force combat veteran Col. Vincent H. McGovern, 88, died on February 22, 2011 at a hospital near his home in Duluth, Minnesota.